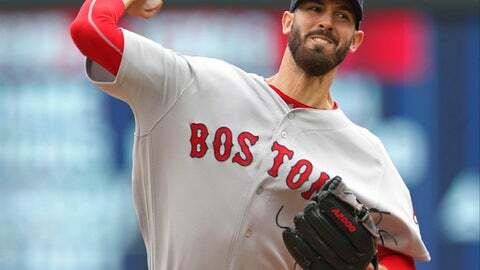 MINNEAPOLIS (AP) What Rick Porcello did six days ago carried over into an outstanding performance. Porcello allowed one hit in seven innings, Mookie Betts and Andrew Benintendi homered, and the Boston Red Sox beat the Minnesota Twins 9-2 Thursday to avoid a series sweep. Xander Bogaerts had two RBIs for the Red Sox, who had a season-high 16 hits, and finished 6-4 on a road trip through Baltimore, Seattle and Minnesota. ”We definitely needed a win today, especially to end this long road trip after dropping the first two games to these guys,” Porcello said. He was dominant in a game that was 2-0 through six innings. After a first-inning single by Logan Morrison, ending a 0-for-30 stretch against Boston, Porcello (9-3) retired 19 of 20 Twins hitters, including the last 16. Throwing 97 pitches, he struck out five and walked one. Porcello finished seven innings for the first time in 10 starts since April 29. His best previous start of the season was April 12 against the Yankees, when he allowed two hits and struck out six in seven innings. Last Friday in Seattle, Porcello allowed four earned runs and seven hits in six innings. But his mood was much different in the final inning. ”I was just pitching a lot more relaxed, the delivery was smooth and I executed, so I tried to carry that with the tempo and everything into today,” he said. ”He was under control,” said manager Alex Cora. Kyle Gibson (2-5) allowed seven hits and two earned runs in six innings for Minnesota, striking out five for his ninth quality start this season. He had only 10 in 2017 and eight in 2016. Betts hit the first pitch of the fifth inning into the front row of seats in right-center for a 2-0 lead. He finished with three hits and has reached base eight times in his last three games. ”He likes to take a lot of first pitches and then once in a while ambushes, and he got him that time,” said Twins manager Paul Molitor. The Red Sox were 5 for 14 with runners in scoring position, finishing the three-game series 7 for 36. Bogaerts’ two-run double keyed a three-run seventh against Ryan Pressly. Benintendi hit a two-run shot in the eighth. With left-handed hitting Joe Mauer up, Betts, playing right field, shifted to right-center and barely had to move to catch a fly ball. Betts then waved a card telling him where to play toward the dugout. Porcello moved into a tie for the American League with his 10th hit batsman in the first, when he knocked Eduardo Escobar down with a fastball that plunked the major league leader in doubles just above his right elbow. Escobar stayed in the game for two more innings, but was removed after striking out in the third, and was diagnosed with a bruise. In the top of the inning, J.D. Martinez had to hit the dirt to dodge a high-and-inside pitch from Gibson. ”It didn’t look particularly good to me,” said Molitor, pausing to choose his words carefully. Gibson hit Sandy Leon with a pitch in the sixth. In the game Tuesday, Red Sox starter Chris Sale hit Mauer before Jose Berrios plunked Betts and Mauer was hit again by reliever Robby Scott. Red Sox: LHP Drew Pomeranz, out since June 5 with left biceps tendinitis, is expected to get on a mound this weekend and throw a bullpen session, according to Cora. Twins: OF Eddie Rosario missed the game with a sore throwing shoulder. He is considered day to day. Since May 1, Rosario is hitting .364 with a league-best 68 hits in that span, including 16 doubles and 13 home runs. Red Sox: Open a six-game homestand Friday with RHP Steven Wright (2-1, 1.23) scheduled to start against Seattle LHP Wade LeBlanc (3-0, 2.63). Twins: Welcome Texas on Friday for a three-game weekend series with RHP Fernando Romero (3-2, 4.17) to face the Rangers’ LHP Mike Minor (4-4. 5.35).